From his studio in the attic of the house on the corner of Boulevard Van Iseghem and Rue de Flandre in Ostend, Ensor had a nonpareil view over the rooftops of his hometown. There are several paintings and drawings on this topic (Large View of Ostend, 1884; Rooftops of Ostend, 1885), including the oil painting Boulevard Van Iseghem of 1893 in the Musée Van Buuren, Brussels. The subject of this engraving (Boulevard Van Iseghem, Ostend, 1889) is a In other prints, such as: (View of Ostend in the East, 1888; View of the Ostend Harbour, 1888) Ensor provides us with a view of the Ostend quayside with ships moored. He also took delight in portraying the views of the environs of Ostend: fields and farmhouses. In other engravings (Small View of Mariakerke, 1887; Large View of Mariakerke, 1887), the artist provides us with a vista on the small church Notre-Dame-des-Dunes. Ensor was always charmed by the place and often drew, painted (Large view of Mariakerke, 1896; View of Mariakerke, 1901) and made engravings of it. 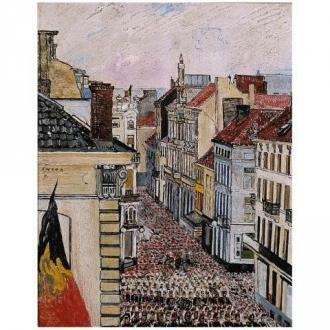 Ensor was also inspired by city vistas of Brussels. In 1885 he painted the tower of the city hall (Hôtel de ville, Brussels, 1885) and made an engraving of the Boulevard Anspach (House on the Boulevard Anspach, 1888) and of the Rue du Bon Secours (Rue du Bon Secours, Brussels, 1887).